Obtain the relationship between the quality of neighborhood and the migrations of people of people to them. 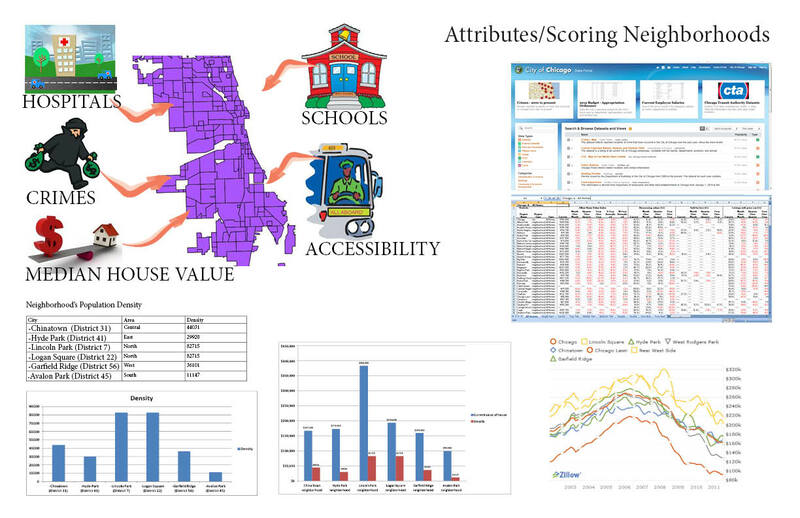 Through the analysis of attributes such as health care, education, transportation accessibility, and crime rate, we were able to indicate the popularity of a neighborhood and wither some attributes are more important than others in ranking the value of a property. 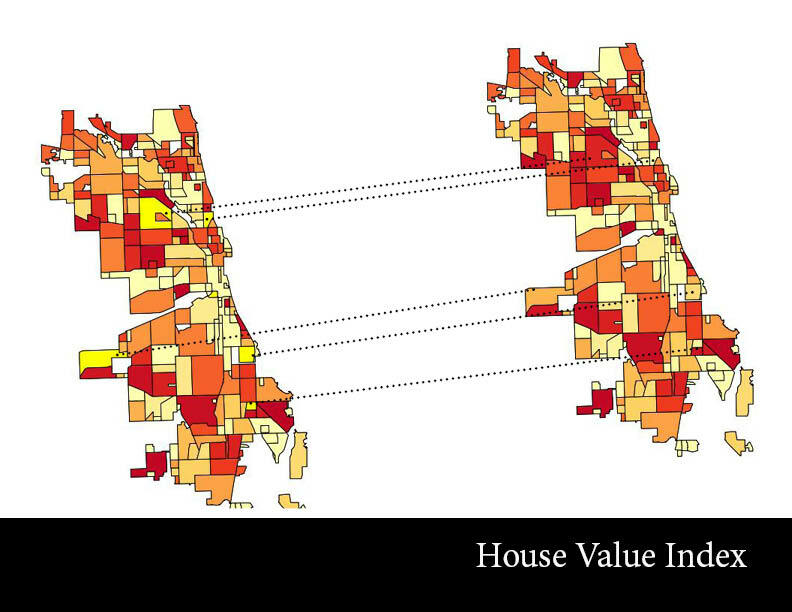 Our analysis will be focusing on the relationship between housing value in 6 main neighborhoods from different location of Chicago and amount of people who relocated from or to them. 1- The data available with us should be translated into maps that illustrate the quality score for each of the chosen neighborhoods. 2- The analysis of the data should be driven from maps that are done using the CSV files, and shape files downloaded from Chicago website. 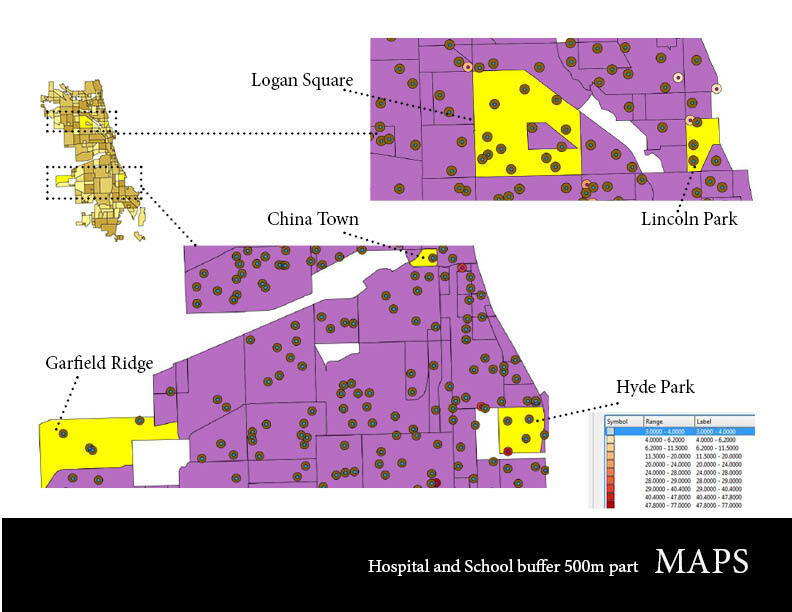 Using the Software QGIS, PG Admin will help in driving maps with analysis of Chicago neighborhoods. 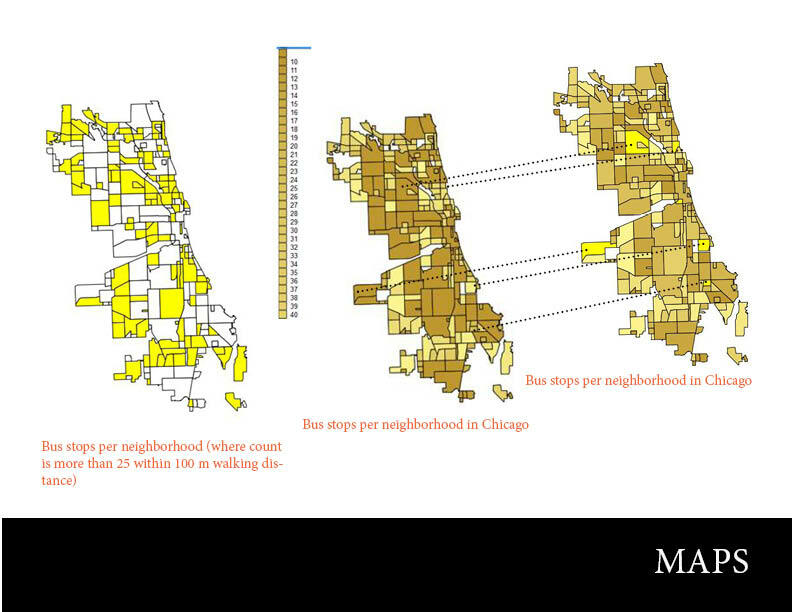 In order to understand the pattern of migrations within the neighborhood’s of Chicago, the study had to include a method of scoring the quality of a neighborhood. A quality would be driven from series of calculations and equations that will be translated later into queries in PQ Admin II then into maps. 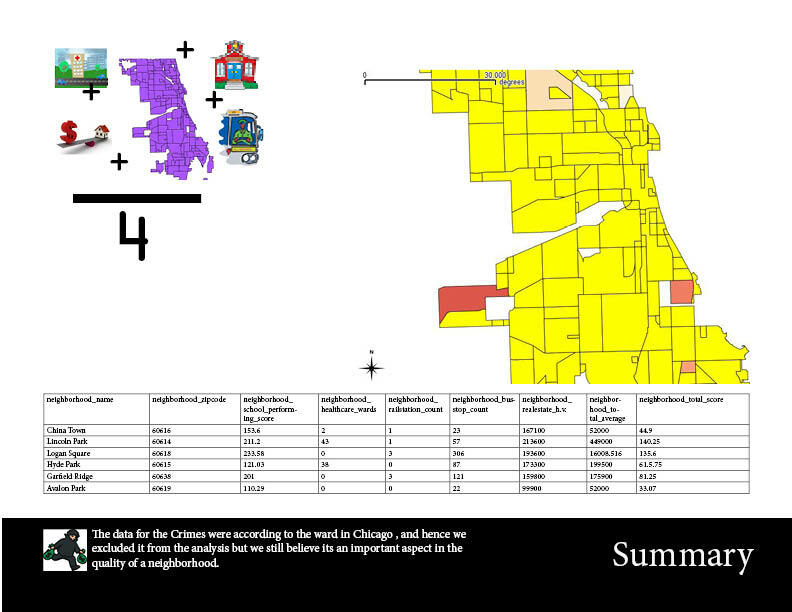 After checking the accuracy of the data in the tables that are done with POST ADMIN II, queries were made to connect the tables we have to the QGIS .This step is important in order to match the data to the shape file of the neighborhoods of Chicago city. 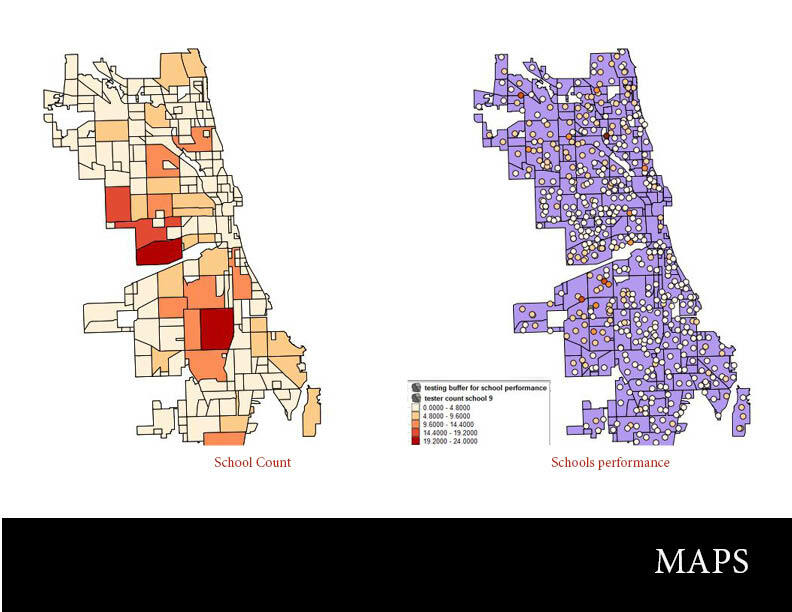 After making the maps, analytic comparison driven from the visual information in the maps, and also from the value of the quality averages driven from the neighborhood’s score equations. 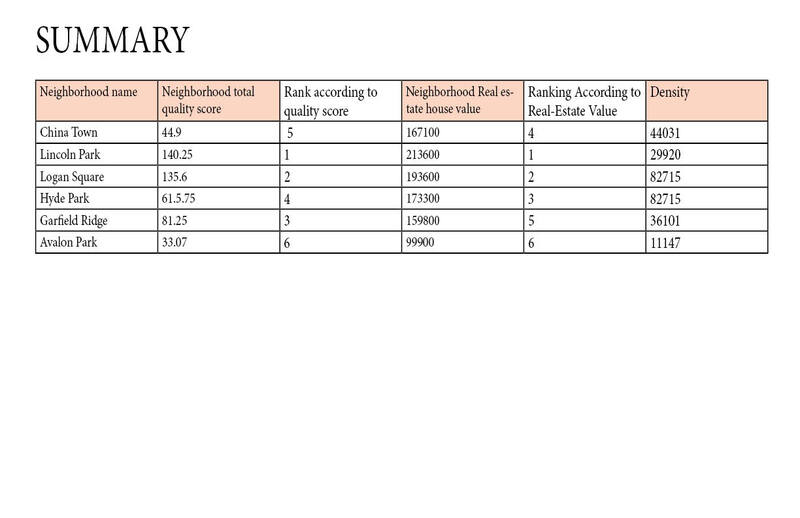 The quality scores showed that the higher quality neighborhoods were Lincoln Park, followed by Logan Square, Garfield Ridge, Hyde Park, China Town, and Avalon Park. 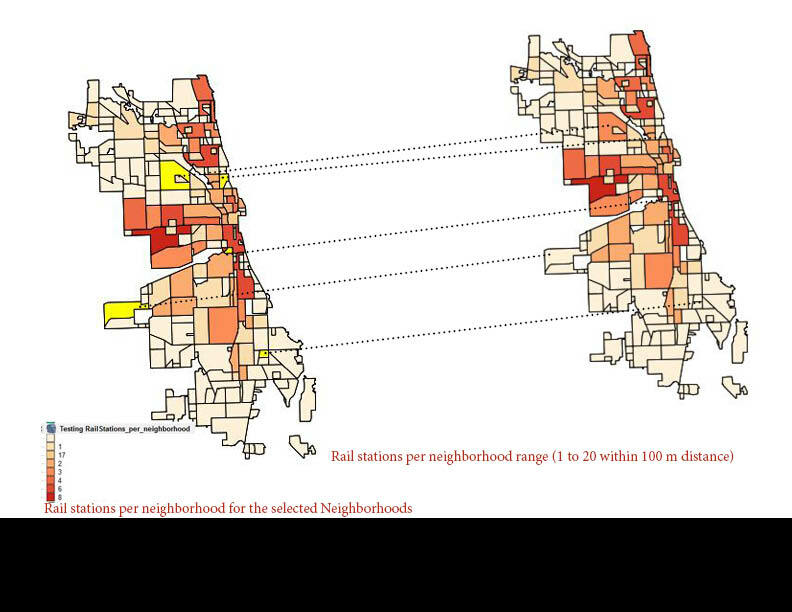 This conclusion however, matched the Real Estate value of Lincoln Park and Logan Square, and Avalon Park only. 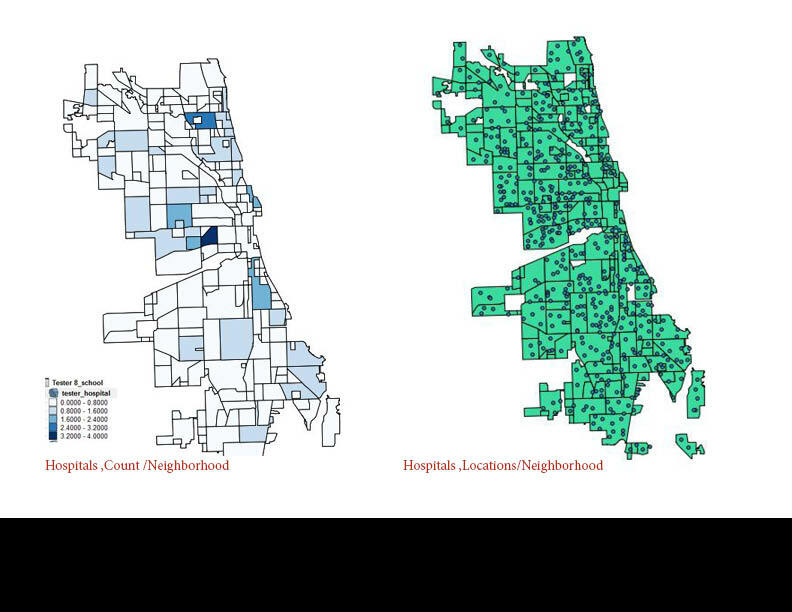 Hyde Park and China Town had different real-estate values that didn’t correlate necessarily to the neighborhood quality. This led us to a conclusion that there are other reasons such as ethnic backgrounds of populations living there. China Town is a neighborhood that is heavily populated with Asian communities, Same as Hyde Park that is also heavily populated with African Americans. The study was only focusing on amenities that a neighborhood would offer and if they would affect the decision of selecting a neighborhood or not. Urban – to – Urban Migration through Recession !!! There’s obviously a lot of talk about the rural-to-urban shift that’s underway in countries all over the world. The majority of people now live in urban areas, and that’s not expected to change. But many countries have had urban majorities for decades. The United States, for example, has an urban population near 80 percent. So while there’s certainly some rural-to-urban migration happening, most of the movement in the U.S. is urban-to-urban.